Can The Collapsible Shot Glass Save Your Life? Unlikely. Unless you drink from it to take medication. Will it be mistaken for a compact telescope? All it takes is some nitwit who’ll pull this out their pocket and exclaim, “I can’t see nuthin’!” Right. Seen below is a shot glass, nothing more. It’s for people who need to lubricate their senses and taste buds every once in a while (we don’t condone alcoholism, by the way). Anyway, the Collapsible Shotglass is self-explanatory, a pocket contraption that can serve as a keychain and is ready for some drinking anytime, anywhere. 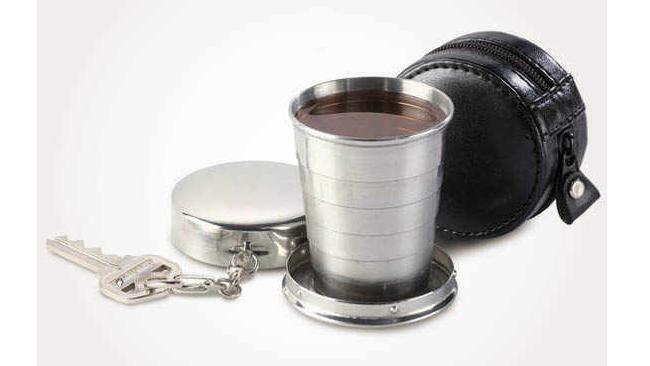 Made of stainless steel and shipped with its own small leather case, the Collapsible Shot glass can hold 1.7 oz of any liquid. It would be awesome if the collapsible shot glass is sold with a collapsible water bottle. Oh wait, that doesn’t make any sense. We’re tempted to explain how having a Collapsible Shot glass around will feed the spirit of adventure among our readers, but that would be futile as shot glasses are usually responsible for lots of splitting hangovers. Now a regular-sized telescopic glass for camping and outdoor types, that’s something we can get behind. Sadly, this ain’t it. The wonderful Collapsible Shot Glass is currently selling for $16.